Pets in prisons - Should they be allowed? Many people will have heard of the ‘Birdman of Alcatraz,’ a notorious criminal who, during the 1920s, was allowed to keep birds in his cell at Leavenworth Penitentiary, Kansas. Remarkably, despite his violent history, Robert Stroud had a soft-spot for the sparrows that visited him in the prison yard and was eventually allowed to keep them. Before long he was offered canaries and went on to rear and sell in excess of 300 birds from his cell. Beside his criminal infamy, the Birdman is famous for being one of the first examples of a prisoner with a pet. His observations and contributions to ornithology during his time at Leavenworth, particularly in the field of hemorrhagic septicaemia diseases, are well respected and he has even been labelled 'the best-known example of self-improvement in a US prison' thanks to his birds. In the UK, pet programs aimed at reconditioning prisoners and teaching them lessons in responsibility and compassion are less common than they are across the pond. That said, a number of UK prisons still allow inmates to keep caged birds as part of the ‘Earned Privileges Scheme,’ including budgies and cockatiels. As many as 19 dangerous inmates (17 of which are serving life-terms) at a Category A prison in Durham have the pets, with the majority of these being murderers and serious repeat offenders. Prisoners at HMP Frankland, one of the UK’s highest security prisons that was once home to notorious inmates Harold Shipman and Ian Huntley, are given the privilege of keeping birds in their cells, providing they show good behaviour and maintain the birds to acceptable standards. Understandably, many of the murder victims' families have branded the privilege a 'disgrace' that shows too much leniency to dangerous criminals that are serving terms for serious offences. Defending the privilege, the Ministry of Justice explains the 'pride and comfort' prisoners take in their pets and how they have a 'therapeutic effect' on the prison as a whole. Research from America is promising on this score, showing that inmates who have been allowed pets are far less likely to commit offences inside or have violent outbursts. Prison staff at Oakwood Forensic Centre, Ohio, a maximum security prison for the criminally insane, noticed that prisoners on one ward were suddenly being more cooperative than usual. When they looked into the matter, they discovered that the inmates had found an injured bird in the prison yard that they were nursing back to health. Because of this, the staff at Oakwood conducted a study that permitted pets on one ward but not another. The study lasted a year and demonstrated that the inmates on the pets ward were significantly less violent than the other prisoners, requiring only half the medication of their fellow inmates and making no suicide attempts, compared with eight on the pet-less ward. Similarly, at Washington State’s maximum security Purdy Correctional Centre for Women, inmates were given the chance to adopt and train abandoned shelter dogs. The dogs were placed with the prisoners deemed 'most stable' with the aim of socialising the dogs for future re-homing. The program was a success; dogs that would otherwise have been euthanised were given nurturing relationships, and prisoners gained a sense of purpose and were taught valuable lessons in responsibility and kindness. More importantly, not a single woman released from the program was returned to prison after serving their term. All this would suggest that pets in prisons are an effective measure in rehabilitating offenders. Yet, despite the body of research showing the positive benefits of prison pets, many people still believe pet ownership is a privilege too far. For many of us who can't afford a dog ourselves, allowing them to the country's criminals is not something we might take kindly to. Also, it raises the question: how can dangerous individuals be trusted to care for innocent and helpless animals? 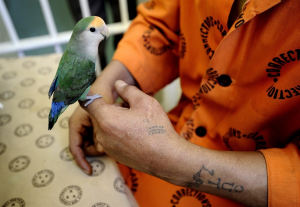 Once given an animal, the inmates are fully responsible for its day-to-day care. This includes feeding, grooming, obedience training and housebreaking. Of course, all persons participating in pet programs have to meet strict criteria before they are granted an animal. This usually means being clear of report for 6 months prior to participating and usually having at least 2 years left of their sentence (to allow enough time for training). Inmates are also under constant observation and if an animal comes to any harm, the privilege is immediately revoked. Prisoners with a history of animal or drug abuse are not permitted on most programs. That said, many inmates with convictions of murder are. In Marysville, Ohio, Sharon Young is serving a lengthy sentence for aggravated murder. Despite conceding that "ten years ago you wouldn't have wanted me near your pets," she is now responsible for nursing almost 400 animals back to health every year. This includes orphaned wild birds, rabbits and poultry. Another US inmate, Eric Robertson, convicted of murder in 1992, has helped to train and socialise 22 dogs during his incarceration, providing round-the-clock care to therapy dogs in training. "By working with the dogs, we're giving them a chance to get back to a life that some of us might never see," says Robertson. The waiting list for special therapy dogs is miles long, so could prison training be a step towards a quicker process? Do pet programs demonstrate how the prison system can aid in the rehabilitation of criminals, while serving the community at large? Or, should the privilege of pet ownership be reserved for those staying on the right side of the law? Whatever your thoughts on the matter, please share them with us! I do not agree that prisoners should keep a dog or cat in prison, and consider it to be a form of cruelty. It is an absolute fact that all animals are entitled to a normal pleasant healthy life, with good food, and in the company of normal people who give care and understanding. Remember the saying 'a dog is for life not just for christmas' and apply this to the prison environment. Prisoners are serving a sentence, do not punish the animals as well. I think this is the best thing the prison service could do for the prisoners. The prisoner do not have enough to occupy them and this could be it . Therapy dogs take ages to train. Look how many people need some sort of therapy dog, they need more Pat dogs the trraining could be done by the prisoners, also if they trained some of the dogs that are in rescue centres, it would make it more easy for them to find them new homes, as prospective new owners would not have to do this . I have little sympathy with the prisoner but most people soften around animals so why not try this and see what happens you never .know you might get reformed prisoners leaving prison and going straight. I really feel it could work its worth a try isnt it. You wouldn't put another human in harms way so why should an animal be any different, they could be at risk and therefore it's cruel. Also why should they have this perk they have done wrong! Using prisoners to help re-habitulate rescue dogs and to save them from euthanasia would seem to be a good idea with the knock on effect of calming prisoners and giving them a reason to behave. I own a Boarding Kennels and Cattery and welcome children from Social Services to come along with their befriender or family member to visit the animals in our care. Many are extremely quiet and withdrawn and will not communicate with other adults or staff members. They do however form very strong bonds with the animals in our care. The animals even look forward to their visits.After a few visits their communications skills improve and we get positive feed back from their befrienders on how their personalities and behaviour have changed since they started coming to the Kennels and Cattery for their visits. I do think it is definately a way forward introducing pets in prisons. yes yes and yes again. Pets should definitely be allowed in prison. Imagine a person who has a pet and is sent to prison (not necessarily fairly convicted). What would happen to his/her pets? Should they lose their owner? Would they understand why they were being abandoned? Should they suffer too?Taken by RSPCA, destroyed, passed to a home the pet isn't accustomed to? The pet wouldn't look on prison as his/her prison, they would just be in a different place with their owner - an adventure for the pet. So many inmates go through loss so are punished tenfold. I honestly believe this would not only benefit the prison service, but the pets as well. There would be less stress for RSPCA, rehoming centres or family members taking on pets. It just makes perfect sense to me. I strongly believe a person convicted and serving time in a prison should be allowed to take their own pet/s. It wouldn't be prison for the pet but it would save them pain, confusion and grief, when losing their owner and take up less much needed space in kennels and catteries etc. Just put yourself in the place of the pet. I totally agree that prisoners should be allowed the opportunity to care for animals. They would be monitored and what better way for animals and humans to learn to trust each other, putting each other before all else. If it saves one animal or one human what more could you ask??? Yes - pets should be allowed in prisons. Many prisoners have mental health problems and pets can really help with such illnesses. People do not choose to have a mental health problem, it is an illness just like cancer, and society should try and help such people much more. I remember seeing a programme from Australia about inmates training future guide dog pups. These guys turned around completely and one went on to be a dog trainer after his release. As long as there is a tough selection process and enough supervision I think it's a great idea. Not just a pet to have in their cell but training a pet therefore putting something back for the community and giving them a purpose. I dont understand people who don't want prisoners to be rehabilitated, just punished, surely that just makes them much more likely to be a repeat offender? Yes. But as long as they treat the animals with respect. It seems to me that you are putting the so-called welfare of prisoners before the consideration of what it will mean for the poor animals/birds that will be in effect imprisoned as well. Keeping birds caged is disgustingly cruel, just so some un-deserving individual can have a "pet". Also, dogs and cats will obviously not have any normal outside surroundings, just a concrete landscape. And exercising dogs in the "yard" is a total no-no. What right do these "do-gooders" have to consign these animals and birds to a life so un-natural. As far as I am concerned there is a limit to what "rights" a prisoner should be entitled to, and these have been grossly exceeded already, more often than not due to mis-guided "Human Rights" legislation. I am not in the least interested in the prisoners welfare; they have through their own actions, put themselves where they are, and must therefore accept the consequences. Their crimes have generally totally ignored the "human rights" of their victims, and they in turn should not expect or be accorded any themselves. I am fed and sick to death of these so-called woolly liberal minded people campaigning for prisoners rights; why do they not campaign for the victims rights ? So to finish, if it is not already clear, I am totally opposed to pets being kept in prisons, and am very disturbed that an animal welfare organisation such as yourselves appear to be indirectly condoning what can only be described as outright cruelty. I believe this is good as long as inmates are monitored closely. It has the positive light of saving animals and them being accepted into loving homes. Keeping inmates active as got to be the positive component in their rehabilitation! Ongoing studies and reviews needed consistently !!!!!! This is LUDICROUS !! You know there meant to be in there to deny them there Liberty as punishment for the crimes commited !! They have already got tv in there cells,playstation type consols again in cells,they have duvets and some put curtains up !! Now its going to be pets ?? Who thinks these things up ?? IT's a joke saying is punishment when getting imprisoned,now pets !! The people who have lost jobs caused by cutbacks,people evicted from there homes,the homeless on the street,especially NOW with the housing shortages,so people are going to or maybe even have commited a crime to purposely jailed,its more like a b&b or a hostel but instead there's no bills to pay and also fed 3 meals a day,better to be there being looked after rather than sleeping in the streets etc,just go in the nick,HMP Hotels !! A very well-balanced article. Basing my response on the behaviour of my two cats, I would not advocate cats in prisons because cats decide whether they want to be indoors or out. My cats make it very clear when they want to go out and whilst we were hoping they would want to stay in, they have settled on a balance of roughly half and half, a decision we let them come to on their own. Whilst there is no denying the therapeutic benefits of owning a pet or having access to animals, both are a privilege. The question this article raises is what do we expect from our prisons: punishment or rehabilitation? To the person who said it is not a natural life for an animal, nor is being in a shelter, with no love, no hope and only death to be welcomed. Too many animals have no hope of ever having love or care or a home, too many get euthanised, so what does it matter where that home is, as long as they have one. Yes as long a they are supervised. The RSPCA has lots of animal which need one to one care to socialise them and calm them down. This could be good for them and the prisoners. Animals can be very therapeutic. Yes I think prisoners should be allowed to have an animal provided it is under appropriate supervision.Under the right circumstances they may well be of benefit to each other. I have never been on the wrong side of the law and never will. I am amazed by some of the comments people make. i.e. " putting the animal in harms way" and "LUDICROUS !!". Whats wrong with people if a prisoner can help to train a dog to aid blind people and other useful rolls that dogs can perform to help society outside of prison then we would be silly not to make use of these people. If it also helps to rehabilitate prisoners and stop them from reoffending then that is a bonus. The last thing we want is people comming out of prison and going straight back to crime. I say lets give them a chance to give something back to society and earn their keep. It's a very debatable question. On the one hand it surely would be better for the pets not to be seperated from their owner when they are sent to prison, but they would need to be monitored closely. On the other hand I agree that prisoners already have many "perks" when the main premise is to be punished! But if they are seperated it would be the dog being punished wouldn't it? Also it would depend on the type of pet, some would definitely not be at home in prison, i.e. cats, because they are so independent. A very interesting debate! What an interesting idea. On the one hand it would be good for prisoners to take their pets with them, to prevent the distress of being separated, mainly on the dog's part, also it would relieve the burden on re-homing centres. On the other hand, yes it would seem that the prisoner is being rewarded, whereas the main premise of prison is punishment! But the pet is actually the one being rewarded, by being allowed to stay with his/her master. Then again it also depends on what kind of pet it is, some would not be suitable I suppose cats come to mind; they are such independent souls. Again, some cats are happy to be "indoor cats" and that could work. A very interesting debate! I absolutely do Not agree that any animal should be subjected to prison life. If a dog has come from a shelter do you not think it has spent enough time behind bars, does it not deserve fresh air, a loving family and a comfy sofa. Plus prisoners are there to serve a sentence not to live a life of luxury, so why should they be given such luxuries. A Dog is for life... Not for Prison! NO, NO, NO ,NO NO why the hell should they be allowed pets?????? they have all other creature comforts, the human rights have seen to that. Never mind what the victims have to live with for the rest or their lives, we should take a leaf from the USA prisons and at least life means life over there. An old saying "if you cant do the time, then don't do the crime." I could not disagree more with the proposal of allowing prisoners to have pets in prison. I think it is a very misguided concept, with only the prisoners and "do-gooders" wishes being taken into account, and with very little consideration being given to the animals long term welfare and suffering. These poor creatures will in effect be imprisoned as well, just so un-deserving criminals can be given yet another luxury. I do not know who these people are that obviously consider the welfare of prisoners to be paramount above all else. It is just a pity they do not expend as much time and effort in helping the victims of these criminals, who in general have no one else to blame other than themselves for being "inside". Why they and these woolly minded liberals who care about them so much, think they have "rights" when they have violated the "rights" of their victims without compunction, infuriates me. As far as I am concerned they have forfeited entitlement to any "rights" for themselves. That should be part of their punishment, but of course we also have to put up with these idiots in Brussels who keep interfering and demand "human rights" for prisoners, again without any reference to the "human rights" of the victims. I think these people live in cloud cuckoo land, but unfortunately they appear to have an unjustifiable influence and it is high time they were ignored. Returning to the subject of pets; for a start keeping birds in cages, which they will be in the prison environment, is sheer cruelty. Also, to deny cats and dogs access to a proper "green" environment is again un-acceptable cruelty. Just to have a concrete yard for so called exercise is a denial of the animals "rights", but of course although we like to think of ourselves as a civilised society, animals have very few "rights", as they are considered to be only there to serve the "superior" human animal. The way some animals are treated is nothing short of barbaric (for example fox hunting), and as a so-called civilised country we should be ashamed that their welfare is often abused so ruthlessly. So to sum up then, a big NO. Animals should not be subjected to a prison environment. Their welfare should be more important than that of criminals. People who have learnt not to care for other beings and develop compassion and love will not change unless given the opturtunity to do so. Any means through which we all can develop more empathy is good for the human race. This scheme is not about being a "do-gooder" but is "wisely selfish" act of those who understand the benifit of a well functioning human being and in turn a well functioning society. This scheme does not have to be carried out in away that is anyway detrimental to any animals if governed by empathy for ALL beings concerned. Brilliant idea!